A northbound train struck a vehicle on the tracks in San Mateo late Tuesday, injuring one person and leading to significant delays for passengers, Caltrain officials said. 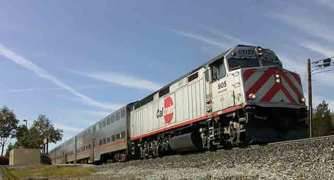 The crash was reported via Twitter at 6:28 p.m. when northbound train No. 277 hit a vehicle at the Fourth Avenue crossing. One vehicle occupant was taken to Stanford Medical Center with minor injuries. There were an estimated 700 to 800 passengers onboard the train at the time of the crash, none of whom reported injuries, according to Caltrain officials. No. 277 stopped after the crash, but was eventually moved to the San Mateo Station so passengers could transfer to another train. Trains have been cleared to travel on both tracks at maximum speed as of 7:27 p.m., according to Caltrain officials, but delays of 30 to 45 minutes are being reported. Further details about the vehicle involved in this evening's crash were not immediately available.